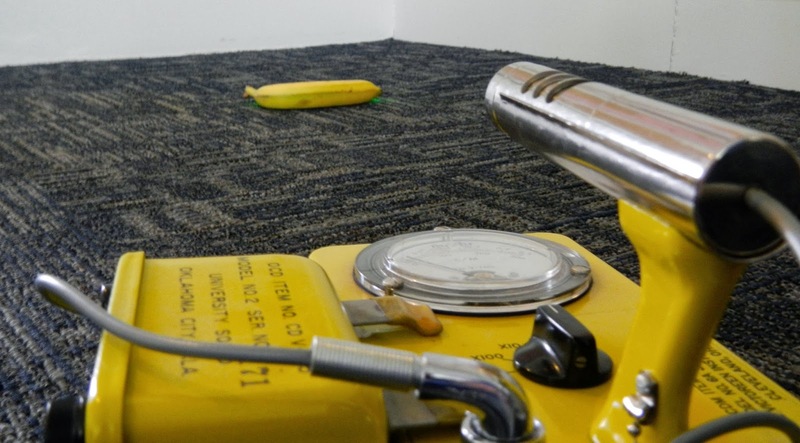 Physics Buzz: How Radioactive (In Bananas) is the Room You're Sitting in Right Now? How Radioactive (In Bananas) is the Room You're Sitting in Right Now? According to recent research (and some of my own calculations) sitting in your living room for an hour yields roughly the same dose of radiation as eating half a banana. A team in China working on improving the way scientists measure a room's radioactivity calculated how much radiation an average room gives off. Everything emits a trace amount of radiation. Bananas, dirt, seagulls, Abe Vigoda and coffee tables are all to some degree a very tiny bit radioactive. It's because radioactive elements like potassium-40, uranium-238 and thorium-232 are ubiquitous throughout the planet's surface, and get absorbed into different materials through various natural processes. They're part of what makes up the Earth's "background radiation." Building materials like brick and concrete are no different. Tiny amounts of the radioactive potassium, uranium and thorium isotopes are inherently mixed in, meaning that even as you read this, the walls are spraying you with gamma rays. To be clear, the amount of radiation is incredibly tiny. It's not remotely near any amount that's dangerous and it's undetectable to all but the most sensitive of detectors. Radiation is essentially energized particles emitted from an atom's nucleus when it breaks apart. Different elements emit one of a couple of different kinds or radiation. Alpha particles, are essentially helium nuclei, and can be easily blocked by a piece of paper or your skin, but can be extremely dangerous if swallowed. Beta particles are electrons and can penetrate a bit deeper. Gamma radiation is actually electromagnetic radiation, like a super-powerful X-ray. 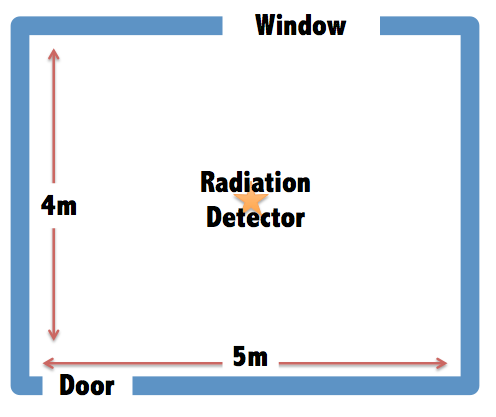 The researchers quantified exactly how how much of the different kinds of radiation someone sitting in the middle of a room is exposed to from its walls, floor and ceiling. It's a fair question, because on average a person spends nearly 80 percent of their lives at home or in an office. To find out, the researchers designed a virtual room five meters long, four meters wide and 2.8 meters high with one door and one window. The team then calculated how much radiation one would absorb in the middle of that room depending on what the walls were made of and how thick they were. The different materials, brick, marble, granite and four different types of concrete, all have distinct densities and concentrations of radioactive elements. The researchers then plugged in the different dimensions into a special computer program called MCNPX which is used to calculate how radiation interacts with, well, everything. So the scientists input in the room's dimensions, the various building materials and the half-lives of the different isotopes mixed in to figure out how much radiation is emitted by the building itself and how much of that a person absorbs at any point in the room. The unit used to measure how much radiation a person absorbs is the Sievert and the team calculated that in one hour, a person in the middle of their simulated room receives a dose of about 56.1 nano-Sieverts, or .0000000561 Sieverts. That's very very small. It takes about 1 whole Sievert to increase your chances of getting cancer by 1 percent. The best way to get some perspective on what that means is to convert it to my new favorite unofficial unit of measurement, the Banana Equivalent Dose. As mentioned earlier, one of potassium's isotopes, potassium-40, emits beta radiation and bananas are chock full of potassium, so a tiny portion of every banana is very slightly radioactive as a result. On occasion, large shipments of bananas have been known to set off radiation detectors at ports. When a person eats an average 150 gram banana, they absorb about .1 micro-Sieverts of radiation. A person would have to eat 27 bananas a day for 100 years to up their cancer risk by 1 percent. After developing their model, the team checked it by finding rooms in an apartment building that were similar in size and composition to what they simulated. The measured rates ended up being slightly higher than expected, about 67.7 nano-Sieverts per hour on average, but still largely in line with predictions. The researchers have submitted their work to the journals Chinese Physics C, and released a draft of it on the ArXiv. I think you meant to say that the measured rates were 67.7 nano-sieverts per hour - rather than the pretty scary 67.7 Sieverts per hour you actually quoted. Ah! Right you are. Fixed! Thanks! I frequently use the unit "banana-second". It is the length of time for light to traverse a banana, and depending on the exact banana, is pretty close to a nano-second. The banana is an amazingly versatile benchmark! The beaches on the South east coast of Florida are radioactive from Thorium. "The measured rates ended up being slightly higher than expected, about 67.7 Sieverts per hour on average, but still largely in line with predictions." I'm assuming you mean nano-Sieverts? The example regarding eating 27 bananas a day for 100 years to up cancer risk by 1 percent assumes radiation doses add up. This is postulated by the LNT model, however, actual experience doesn't support it. Comic rays spallate atmospheric atoms, releasing fast neutrons, then N-14(n,p)C-14, 540 Bq/kg carbon. All living matter should be confiscated, then banned. Comic Rays like Ray J. Johnson and Ray Romano? Wikipedia's article on the Sievert says 1 Sievert corresponds to a 5.5% chance of developing cancer. This seems reasonable since 5 Sv is the LD 50. So the 1% given above is a pretty low estimate. ok, so how many bananas would you have to eat in order to receive the same amount of radiation as an x-ray? Conclusion: Eat all the bananas you want without problem.